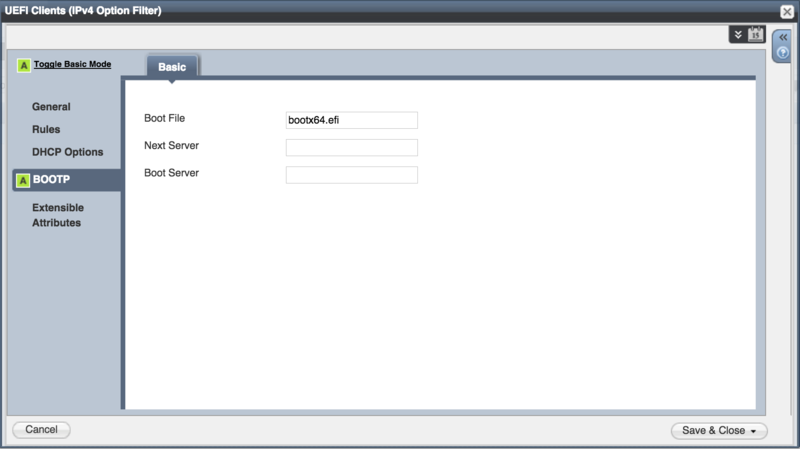 Redhat has a doc that outlines a tidy method to set up a conditional in your DHCP server if you’re using dhcpd. However, with Infoblox it’s a little more difficult. While Infoblox still uses dhcpd under the covers, you can’t touch it directly (although you can view dhcpd.conf if you poke around), so setting up this conditional is a little trickier. Infoblox has a feature called IPv4 filters that will do pretty much this same thing. The tricky bit is determining the format for the filter. Infoblox doesn’t currently (as of NIOS 7.2) allow for setting up a filter on DHCP option 93, or “arch” which is how a UEFI client would advertise itself. 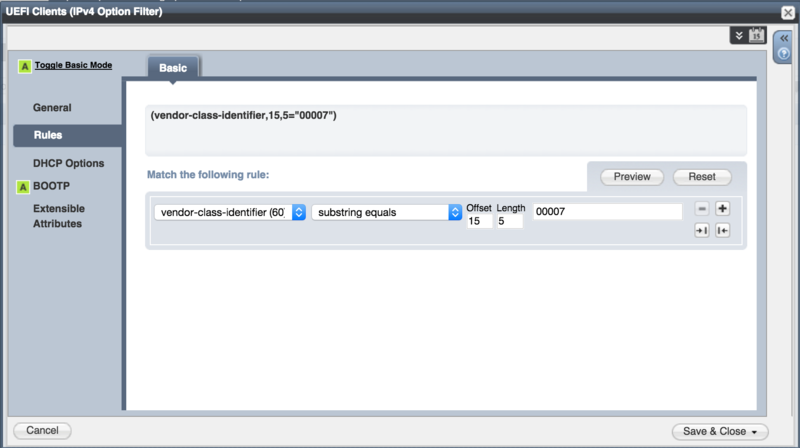 However, it does support filtering on option 60, which is the vendor class identifier. The tricky bit is figuring out the vendor class identifier you want to filter on, since Redhat’s docs specify the “arch” option in dhcpd.conf. This post on the syslinux forums gave me the bit I needed. The entire “vendor-class-identifier” option is passed to the server during a DHCPDISCOVER request, which is what Infoblox can filter on. This took me a bit to figure out, since I set up the filter in Infoblox and it didn’t work right away. This led me to believe that the format of the vendor-class-identifier string used in this syslinux forum post didn’t match what my client was using. Fortunately, wireshark set me straight, so running a packet capture on the DHCP interface on the proper Infoblox member showed me exactly what was in the request. As it turns out, I should have believed what Spike had posted all along. The initial trouble was on my side – I set up the substring to look at offset 15, length 4, of “PXEClient:Arch:00007:UNDI:003016”. Since the first character offset is zero, not one, this returned “0000” and not “0007” like I had set up in my filter. The fix was to change the length to 5 characters and match on “00007” instead. Here are some screenshots of what the end result should look like. This entry was posted in Infoblox and tagged bios, bootfile, dhcp, infoblox, uefi by cidrick. Bookmark the permalink.